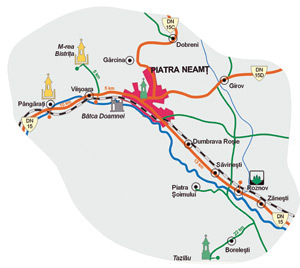 For every ordinary pilgrim, Piatra Neamt, the residence city of the Neamt district, represents indeed an “urban island” in the mountains. In the natural amphitheatre formed at 310 m altitude by the Cozia, Pietricica, Batca Doamnei and Cemegura hills, one may find important historical and art monuments. The three Dacian fortresses, dating the first century BC and the first century AD, that were discovered during the archaeological works at Batca Doamnei, Cozia and Horodistea, were associated with the ancient town named Petrodava, town that was mentioned in Ptolemeu’s writings as well. In other words, it may be considered that the town existed even 2000 yeas ago. In a document dating Alxandru cel Bun’s reign, Petrodava appears under the name of “Piatra lui Craciun”. Soon after that, the town was chosen by Stefan the Great to be a strategical point. 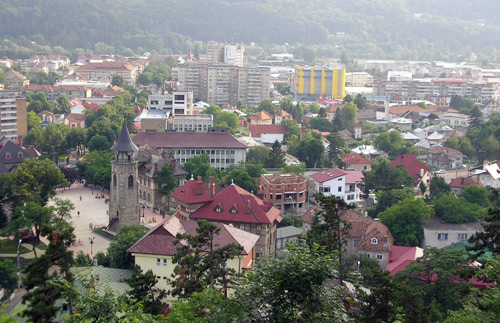 In 1841, the educated man Gheorghe Asachi established the first Moldavian “paper mill” at Piatra Neamt and in 1872, Petrache Liciu founded the first theatre in that area. The Ensemble of the Former Lordly court. It was built between 1497-1499 during Stefan the Great’s reign and it holds a magnificent architecture monument, which is decorated with enameled ceramics on the facades and it also holds a tower (10 m tall) with an external stairway which makes the access to the first floor possible. 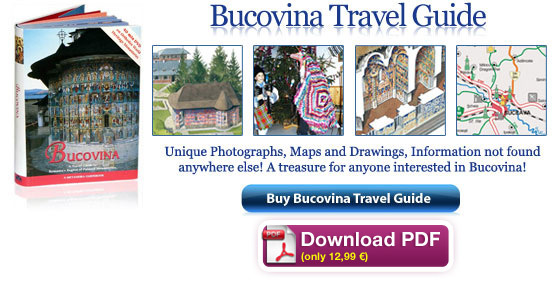 Both buildings reveal characteristics of the Moldavian architecture style. The History Museum. Built in 1934, reorganized in the present building in 1980. It holds 36 halls. Among other things, here one may find a valuable collection of Neolithic painted ceramics of Cucuteni style( an unique masterpiece is “Hora de la Frumusica” which is an anthropomorphous support over four millennia old), a Thracian hoard of golden vessels, an extraordinary Roman hoard of silver vessels(both hoards were discovered in 1972 and weigh over 1 kg), a precious numismatic collection with Greek , Dacian, Roman, Byzantine and Moldavian coins (dating the XIV-XV centuries) and various things that were found during the archaeological works at Batca Doamnei and at the former Royal Court. The Ensemble of the Former Lordly court, built during Stephen the Great. The art museum. It was opened in 1980. It holds many Romanian works, belonging to the Romanian plastic art. The main exposition is dedicated to the painters Lascar Viorel and Aurel Baesu. The Natural science Museum it was established in 1960 and keeps the most valuable collection of Oligocene fossilized fishes in the country. 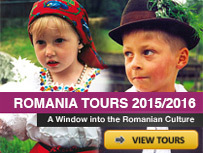 There are also exhibits belonging to the following fields: mineralogy, botanics and geology. The Ethnography Museum it holds an interesting collection of popular clothing, tools which used to belong to handicrafts-men and traditional rustic outfits originally to the Neamt area. “Calistrat Hogas” memorial museum, organised in the house where the writer and the traveler that roamed through the Neamt Mountains-Calistrat Hogas- used to live and write his books. 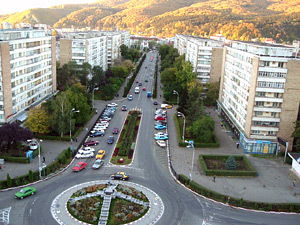 The park of the town. Built on the Southern side of the Cozia Mountain, nearly a century ago. From there one may get an amazing view over the city. The ruins of the Dacian fortress from Batca Doamnei. They lie on the right bank of the Bistrita river, on the way out of the city. Here one may see the walls of the precincts, the two sanctuaries, a fragment from the palisade, traces of Dacian settlements. Bistrita Monastery. On the road from Piatra Neamt to Bicaz, following the road DN 15 for five km and then turning to right to a country road for another 5 km. Afterwards, Bistrita Monastery is at full sight, being one of the oldest Moldavian monastic settlement. 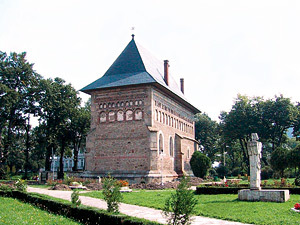 Alexandru cel Mare completed the construction of the church before 7th Janaury 1407, church which became a very important pilgrimage centre.